Factual correctness is only one measure of objectivity. Neutrality and truthfulness also play a part, but it is difficult to be neutral even if we strive to remove our bias, because language itself does not permit it. English usually has at the very least, three different words for the same thing. One is Anglo-Saxon (usually direct and informal), one French (usually formal and denoting sophistication) and one is clearly derived from Latin or Greek (abstract, usually specialised or technical). Consider then luck, fortune and success. The first–anglo-saxon and monosyllabic–has earthy and gutteral notes, the second–french–is aspirational and noble, the third originally meaning ‘happy outcome’ from the latin successus is nowadays much more associated with drive, education and ambition. Our word choices, even if–or perhaps especially if–unconsciously made, reveal our attitudes, values, bias, education, self-image and purpose. For a man of letters like Stephen, who has made his fortune from a personal brand of verbosity, that means his objectivity in linguistic matters comes under question. Does that mean his opinion is invalid? On the contrary, as an expert his opinion is valuable even if that expertise has been gained indirectly through his privilege. Few can write objective facts ‘neutrally’ because every word contains nuance and will resonate with an audience who identifies with those attitudes, values and bias. That cannot be helped. But knowing more about Stephen Fry at least allows his readers to make a better informed interpretation of his words. Neutrality aside for a moment, if a journalist’s role is to report the truth, the truth is that life is not only factual. We live inside a reality construct which tells us that a piece of watermarked paper is equivalent in value to a bunch of bananas, and because we all accept this fiction as fact, it becomes true for us (even though any monkey would tell you differently). Truth therefore does include a mix of both fact and fiction, and to say otherwise is to oversimplify our reality. Moreover, everyone has a personal truth, a function of many underlying narratives and this is likely to change over time as new perspective is added. During my second lecture as a freshman student of journalism, the lecturer presented the empty vessel theory of reporting. A journalist was traditionally instructed to let facts to pass through their pen unbiased as far as possible, thus handing the responsibility for their interpretation over to the reader. For much of the nineteenth and twentieth century, journalistic objectivity has been regarded as an ethical gold standard, but as a twenty first century blogger for feminist magazines, I (subjectively) objected. The magazines I write for only commission op-ed and I write from my own perspective. It is considered that I am only qualified to speak about my own experience and my articles are commissioned for that very reason. The feminist line of thinking argues that it is unethical to take the space from other voices; especially where it risks reinforcing the existing power structures. Initially though objectivity in journalism had an ethical intent–to report facts, rather than propaganda. In our times, fake news is an increasing preoccupation. Walter Lippmann, the father of objectivity in journalism decried the excesses of so-called yellow journalism, with its absence of verified and factual content. But his views gained traction with mainstream newspapers only because they sought to gain a bigger readership and authority in the growing middle class regardless of political affiliation–by becoming ‘objective’ and eliminating partisanship. The middle class at that time was dominated by educated and entrepreneurially or politically ambitious white men. Capitalism was the driver which compromised the very notion of objectivity from the outset–it was developed by white men of a certain class, money and education for other white men of the same class, money and education. Objectivity in terms of dispassionate detachment by means of a lofty linguistic style was deliberately exclusionary and consequently not impartial nor objective. Today we still live in a capitalist system and money is paramount to our survival. Content aggregators take advantage of this fact to produce sensational, low quality, third-party, rehashing and reporting. Many news outlets reward writers who deliver the most clicks and quickly, over corroborated content which is likely to be less clickbaity and takes more time. If we don’t play the system we’ll be out of a job. And even if we aren’t, the immediacy of the internet encourages the virality of scandal means that our integrity is under threat because we are all creatures who easily conflate popularity with validation. Which means that when push comes to shove, objectivity is more of a theoretical concept than a realistic destination. More problematic still is that objectivity implies a ‘rational and calm’ style. It misses the truth that decisions are taken because of emotions, actions are taken as a consequence of our limbic reaction, thus journalists have a duty to report not only the factual truth but also the emotional truth. And if the purpose of being rational and calm, as Andrew Calcutt says in his book Journalism Studies, is to let ‘the audience make up their minds without any influences from the media’ I would also argue that writing in a rational and calm manner, does not remove influence. Rather the influence becomes one of a rational and calm narrative–move long now, nothing to see here folks–regardless of the subject matter. This is dangerous because journalism has the power to shape the way society views right and wrong. The refugee crisis versus a slight tumble in corporate stocks therefore justifies different journalistic treatment. Why? Because if we treat all events with the same unfazed, neutral tone and style, we risk perpetuating the normalcy bias, where dead children on the beach matter no more than any other more trivial news item. To present an disinterested and unassuming view of fascist discourse–for example–would be to obfuscate the deeper meaning behind it–the denial of minority group humanity and their right to exist. Such reporting is likely to promote denial and enable oppression. If objectivity requires such impartiality, I believe there is every reason to fight against it. Journalists are after all human beings and journalism as a vocational profession is an extension of who are are, it is not simply what we do. If a modern day aim of journalism is to give voice to the masses, reporting must deliver truth from their perspectives too, so as not to appropriate and erase their experience. The white man’s control of the narrative–slaves were happy, indigenous people moved willingly for european settlers–is well documented in our white history books and rewrite what really happened. Let us not repeat history. So how might such a journalist balance out their own subjectivity when their attempt to balance will necessarily also be subjective? Speaking from their own experience, highlighting potential conflicts of interest, an honest presentation who they are and why they hold certain opinions seem to be obvious benchmarks, even simple maybe, but in themselves not easy to adhere to. They require self-knowledge which can only be gleaned over time as well as an openness to criticism. A willingness to promote other writing and authority over our own, even if that doesn’t serve our our immediate interests. But what if as journalists, we are required to write about subjects about which we are not familiar? I’ve written about the Afghani refugee crisis in Sweden, but I am neither Afghani nor Swedish. It required a lot of historical research, 23 hours of interviews and an attempt on my part to put aside my western judgements of what society should look like when examining a culture where violence is viewed as an instrument of love and self-preservation. The delicate balance of direct citation versus my own commentary was important, as was the sign off by the people I wrote about so that they could confirm I had been true to their point of view. Writing in third person omniscient narrator was a no-no, because there are very few universal truths when it comes to perspective. Even now I don’t know whether I have done it justice (that’s where a good editor comes in handy). 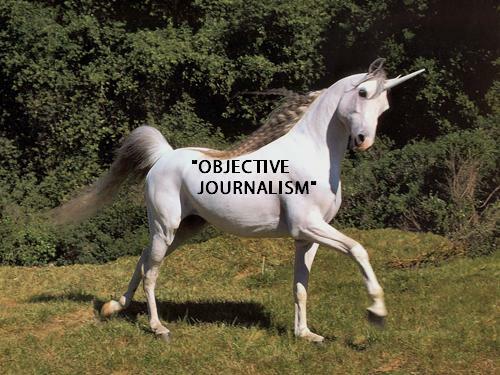 So in the end I believe ethical rather than objective journalism is something we might strive for, whilst also acknowledging that it can only ever be an aspirational goal. Humility is an important part of the journey. This entails a constant commitment to the truth and our reporting must be underpinned by the knowledge that what is true for us is not necessarily true for others. It is also an awareness that words contain great power. Journalists have access to a platform, we have more power than most, and we must wield it with responsibility.